While I am nursing an abscessed tooth and flying across country home, please enjoy this reprint of my first bee-related post from May 2008. The other day I had the distinct pleasure of sitting in a bee yard surrounded by dandelions, long grass, sunshine, and honey bees. The yard was a raggedy green space dotted with 40 or so whitewashed hives, each topped with a large rock. I wore a white bee suit topped with a pith helmet and veil. The bees were busy, as they should be in late May, and their comings and goings crossed my line of vision every which way. They flew back and forth, north to south, east to west, zig to zag. Their hum filled the air, and for a moment there was nothing else. I think of bees; I think of chaos. Look into a bee hive and you see thousands of bees in a mad scramble crawling over and under and around each other. Outside the hive they dart from bloom to bloom. They move with a kind of kinetic imbalance, heading one way then another, as if constantly catching themselves before heading off in the wrong direction. But to associate bees with chaos is wrong. A bee is not aimless. A bee is the embodiment of having a job to do and doing that job with no superfluous movement, no meandering thought. A bee is single-minded, and its role in a hive well-defined. A worker bee collects nectar and pollen, starting the transformation of nectar into honey within her body. In the hive she transfers the nascent sweetness to a honeycomb cell to store as food or passes it on to another worker, who feeds it to the larvae, the bees to be, who are also snugged away in the cells of the comb. The queen, after her one mating flight in the spring, lays eggs, one to a cell, more than a thousand a day. A healthy hive grows and grows until there are so many bees making so much honey that there is enough to share with others who covet honey such as man, such as me. 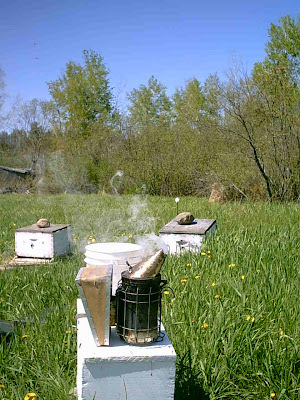 I was in the bee yard helping a beekeeper move some of his hives from nucleus boxes into larger, standard hive boxes. Not that I was really much help. I couldn't stop my mind from wandering, from being fascinated by the bees and their movement. He told me so much about what he does and why - he was telling me about bees and being a beekeeper so I could write a story - but so much of what he said flew in one ear and out the other. Certainly, I thought, I'll retain some of it. Certainly I'll be able to make a story out of it. After all, that's why I am here; that is my purpose. But alas, I know, I am not as purposeful as a bee. As we were leaving the yard a bee landed on my hand and I raised my hand to get a closer look. "Just shake it off," the beekeeper said.